Yesterday I said I was going to discuss how patents impacted innovation. However, I think the first thing we need to do is clarify what innovation is. Schumpeter, described innovation as bringing a product to the market. He claims that without innovation, invention is worthless. Indeed, patents play this out. There is no legal requirement to actually manufacture anything that you’ve patented. I will discuss that in more detail tomorrow though. Schumpeter also notes that these innovations are the source of creative destruction in the economy. He claims that through innovation we are able to keep growing. He called these the long waves. 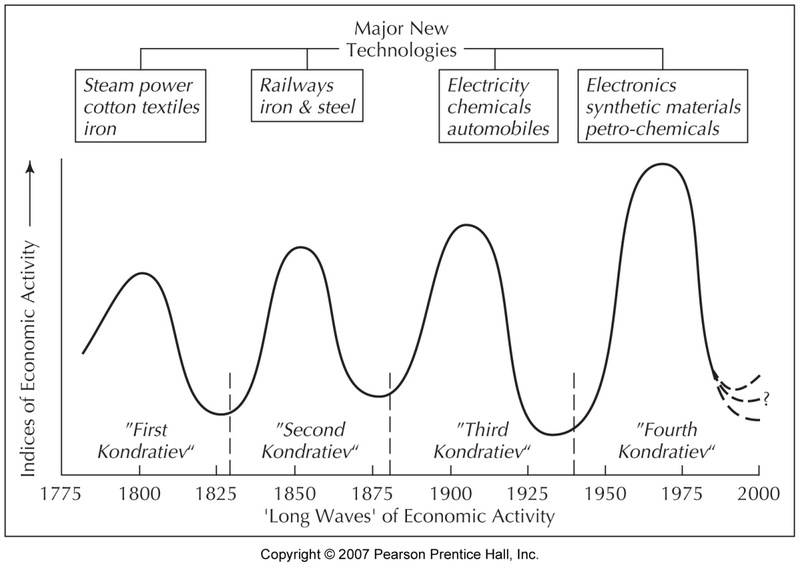 See the picture below for a representation of these waves and the innovations that drove the economy at the time. Most innovation occurs in the upper left hand corner, incremental innovations. These are fairly obvious and most people aren’t surprised to see these products. Products like iPhone 3G after the iPhone first came out. this was an incremental innovation on this product. While Apple did a fantastic job making it sound like it was a radical innovation, it simply wasn’t. The next most likely is the modular. In this case it could be considered that an electric car might be a modular change. As you only have to change one part of a larger piece of equipment. In this case a combustion engine is replaced with an electric engine. The architectural changes are less common than either of the previous. As these ones typically require a great deal of changes within a firm. An architectural change can be described as going from a ceiling fan into a box fan (Henderson and Clark 1990). Seems pretty simple right? Well, there are a lot of changes that go into this innovation. You have to think about how to keep the box from falling over. How to keep the noise down. How to protect the users. You also have to manufacture everything differently. So, in many cases there are two innovations within an architectural innovation. One at the product level and one at the firm level. Another example is the reintegration of the original developers of the Mac into Apple after the successful product launch. The final type of innovation is the radical innovation. This is the stuff that “creative destruction” is made from. When these types of innovations occur most of the previous knowledge base is blown away and the innovators have to start all over again. I’d say the most common example of something like this would be with game consoles. Basically each time a new one comes out everything starts all over again. Other examples can include things like the Jet engine from the propeller. Not only did this require changes in the aircraft but it also required changes in the runway, it needed to be longer than before. There are many cases of Radical innovations and in some cases they completely reworked our economy. IT/ICT is the most recent set of radical innovations that is shaping our economy. These technologies are heavily patented and impact our economy. Tomorrow I will look at how these patents interact with innovation to increase or decrease the rate of innovation. Henderson, R., Clark, Kim. 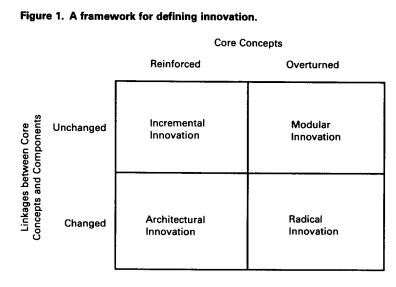 “Architectural Innovation: The Reconfiguration of Existing Product Technologies and the Failure of Established Firms” Administrative Science Quarterly, Vol. 35, No. 1. This entry was posted in Economics, Innovation, Science, Technology and tagged Economics, Innovation, Science, technology. Bookmark the permalink.